Camp Okavango offers guests exclusive Botswana safari accommodation in the heart of the Okavango Delta. Camp Okavango provides guests with the opportunity to discover the scenic Okavango Delta while enjoying luxury accommodation. This Botswana game lodge features comfortable safari suites all situated on raised teak platforms. Each suite has its own private en-suite bathroom and viewing deck. 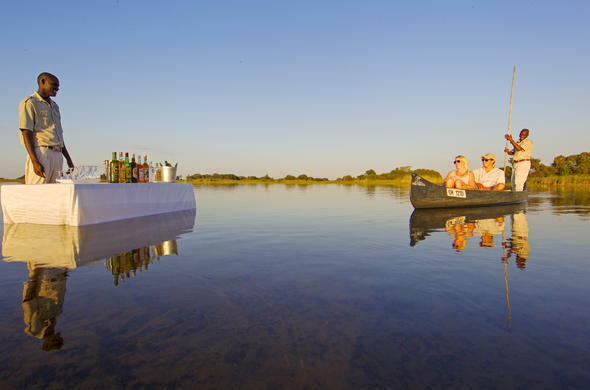 Explore the Okavango Delta's waterways by motor boat or glide silently through the waters on a mokoro (canoe). Join a guided nature walk on one of the many surrounding islands while keeping an eye out for some of the larger animal species. Return to the main lodge after a day's game viewing for a delicious silver servicedinner by candlelight or enjoy a drink at the cocktail bar. A wildlife reference library and comfortable lounge is situated in the main lodge. Guests can look forward to tracking some of the larger species living in the Okavango Delta during nature walks on the numerous islands situated within the Delta. Camp Okavango is the perfect base from which to explore the Okavango Delta. Excursions on a Mokoro are quiet and a great way to encounter the elusive Sitatunga antelope as well as the many bird species that inhabit the Okavango.